I‘ve been fighting off an urge for a grilled cheese sandwich for a couple of months. I don’t know why I was fighting it off, but I was. So this past weekend I gave in. But not easily. In Beard on Bread, James Beard has a recipe for sour cream bread that is the absolute best grilled cheese bread on earth. (Susanne, I think I gave you the wrong recipe when you asked for it.) The bread is tender but also has an open crumb. So as the sandwich cooks and the cheese melts the bread absorbs the cheese. As the sandwich cooks and the cheese melts the bread absorbs the cheese. This brings a new element to a grilled cheese sandwich because it isn’t two pieces of bread containing melted cheese, instead it is a single thick slice of bread suffused with cheese. Mix the yeast, sugar, warm water, sour cream, salt, and baking soda in the bowl of a stand mixer. Using the paddle attachment, add 4 cups of the flour, cup by cup, to make a very wet, sticky dough. Switch to the dough hook and knead for 8 to 10 minutes, adding additional flour as needed to form a slightly sticky dough. Scrape out onto a floured board and finish the kneading by hand. Shape the dough into a ball, place in a buttered bowl, and turn to coat it with the butter. Cover with plastic and let sit in a warm spot to double in bulk. Punch the dough down. Turn onto a lightly floured board and knead for a minute, then divide into two equal pieces. Butter two 9 x 5 x 3-inch loaf tins. Shape the dough into loaves and fit into the tins. Cover loosely and let rise again until doubled. Bake in a preheated 375F oven for 30 to 35 minutes, or until the loaves sound hollow when tapped on top and bottom. Cool thoroughly before slicing. Please forgive me if this recipe seems obvious and fussy, but sometimes we don’t devote the attention and care to a basic recipe that it deserves. Butter both slices of bread on one side. Place one slice, buttered-side down, in a cold cast iron skillet. Arrange cheese on top. Top with the other slice of bread. Turn heat on to medium low. The heat is critical. 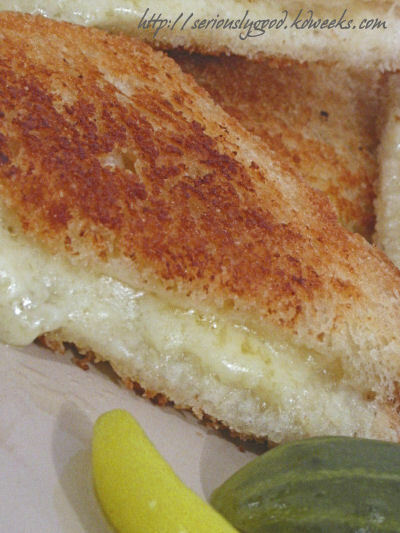 The goal is that the side of the sandwich in contact with the skillet should turn a perfect golden brown just as the cheese begins to liquefy. You will see the butter on the top slice of bread beginning to melt into the bread. This phase can take 10 – 12 minutes. Now flip the sandwich and continue cooking until the other side is golden brown. This will be fairly quick — three to four minutes. Add a couple of slices of tomato on the side and a glass of cold milk and you have a meal the gods would envy. The sandwich is a combination of simple ingredients (bread, butter, and cheese), complex flavor(tangy, sharp, yeasty, and salty), and, perhaps above everything else, elegant texture (crisp, creamy, and chewy). Footnote: I jumped through the hoops, I made the bread, I followed Chef Kevin’s recipe exactly. And I used a bread machine. It. Was. Amazing. Worth all the effort. Shoot me any questions you may have. This was amazing. I’d never had a grilled cheese sandwich quite like it. Time for a re-do! Oh my god, I had no idea Kevin had died and over a year ago! He lived here and no one mentioned that. I last heard from him a while back when he was trying to figure out why he suddenly started getting a lot of traffic from my site, we never did figure that out. Wow. Wow awesome recipe. Its amazing to see bread sandwich with grill and its looking great with pictures.